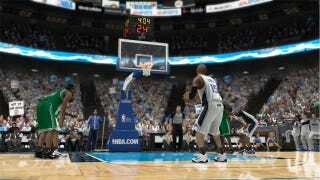 After the disastrous, last minute cancellation of NBA Elite 11, Electronic Arts is keeping its basketball sim video game on the bench for another year, saying that it won't ship a new entry in the NBA Live/NBA Elite franchise until the fall of 2012. "As planned, our next NBA simulation title is in development at our Tiburon Studio in Orlando," said EA Sports president Peter Moore in a statement. "We have top talent on the game, and we're giving the new development team time to deliver a superior experience. We're making great strides and looking forward to launching a new game next year." EA Sports is still recovering from the cancellation of its aborted NBA Live successor and the relocation of development of its basketball sim series. It may also be reacting to a looming labor dispute and NBA lockout that could impact the league's 2011 season. The NBA simulation announcement was buried within a news release that focused on EA Sports' other planned basketball game, NBA Jam: On Fire Edition. A digital download-only follow-up to last year's arcade-style basketball game, NBA Jam: On Fire Edition promises new features like the "ground-breaking AI system used in the Fight Night franchise," a cooperative online campaign, and the return of Tag Mode and Team Fire. On Fire Edition also promises "online roster updates, more NBA superstars, legendary NBA players, over-the-top animations, JAM challenges, secret teams and unlockable characters than ever before." The next NBA Jam is planned for release on Xbox Live and PlayStation Network in October. When contacted for further details about EA's plans for its NBA simulation franchise, reps told Kotaku "We have nothing further to add outside of what's in the press release." In an email to Kotaku, a representative of 2K Sports, publisher of the NBA 2K series, confirmed that NBA 2K12 will be released this year.